Specifically, what is in sight is “an end to the central bank’s portfolio wind-down“. So not only are rate hikes done but QT is also done? 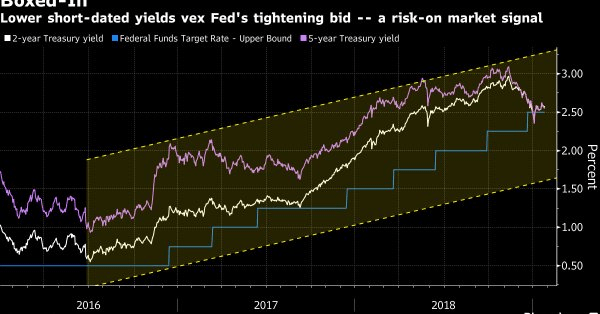 Lisa Abramowicz‏Verified account@lisaabramowicz1 – The Fed is “at the mercy of the markets…That’s why we have re-instigated a risk position” across stocks in the U.S. and emerging markets. The Bloomberg article describes the views of Wouter Sturkenboom, Northern Trust Asset Management’s Amsterdam-based chief investment strategist for Europe and Asia. That firm sees sees “clear sailing for the rally for now.” They are “adding equities and bonds of developing nations while cutting cash and government debt“. Our own belief is that the Fed is steadily falling behind the economic cycle and they have little chance of reversing the US slowdown unless they jump ahead by cutting interest rates. Now that they have 3 weeks of respite from the shutdown, they should use to cut interest rates next Wednesday. But they won’t because of the blasted concept of Fed’s credibility which dictates Fed should move slowly & deliberately rather than moving at battle speed. “People have this stupefying belief that China is different from everywhere else and can grow to the moon, …. China can’t just keep creating credit. They are in a serious growth recession and the trade war is kicking them on the way down ”. He said it is an error to think that China’s current slowdown is entirely deliberate and calibrated. While the People’s Bank undoubtedly wishes to curb the credit boom, it is also riding a tiger that it cannot fully control. And you thought David Rosenberg was un-rosy! Despite all the action in US Stocks, Treasuries can’t seem to maintain their high yields. This week the curve bull-flattened a bit again with the 30-year & 10-year yield falling by 4 bps & 3.8 bps on the week and the 2-year by 1.6 bps. The 5-year yield fell 3 bps to 2.584 once again falling a trifle behind the 1-year yield of 2.59%. German 30-year & 10-year yields fell twice as much as corresponding Treasuries, by 9 bps & 7 bps resp. TLT rallied by about 80 bps while HYG fell by 11 bps. So where could the 10-year yield go? Jeff York, PPT‏@Pivotal_PivotsJan 23 – Is the Fed on Hold? So far, 10 yr. bond yields $TNX tested the 2019 YP @ 2.79% and got rejected there. 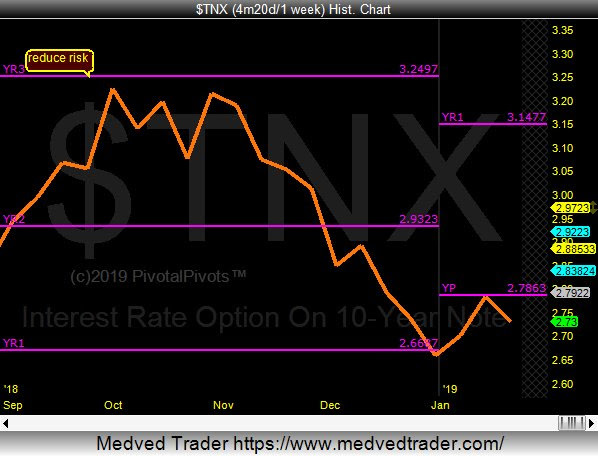 Maybe a clue for the 2019 Ys1 pivot @ 2.33% @PivotalPivots. If you thought 2.33% was low, listen to Carter Worth of CNBC Options Action predict 2.10% for the 10-year yield.
. In fact, Carter Worth recommended a pair-trade on Friday – Sell Amazon & Buy TLT. Was this week a consolidation or the beginning of a down spell? The Dollar fell this week by about 65 bps but maintained its proximity to 96 on DXY. 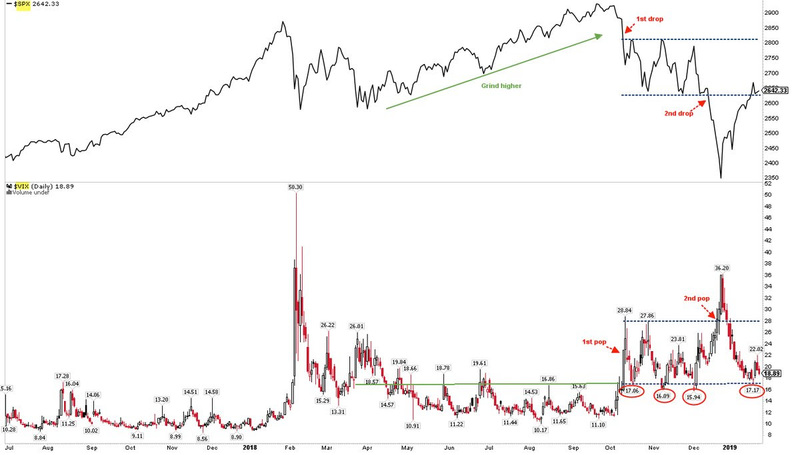 J.C. Parets‏ @allstarcharts – do you guys think Euro is really going to crash here and head back down to the 2016 lows? Or dig in and start to rally from a very logical place? 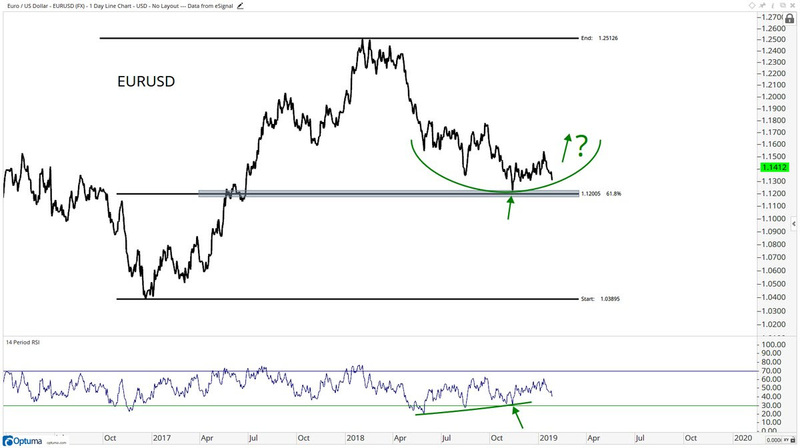 $EURUSD $DXY think about the implications that a weaker Dollar would have…. Mobius said now is the time to buy their equities and favors India, Brazil and Turkey. Mr. Mobius has forgotten more than we know but things don’t look all that great in India right now. The election is a big worry with the prospect of capital fleeing India if the result is a hung parliament with a coalition non-Modi prime minister. 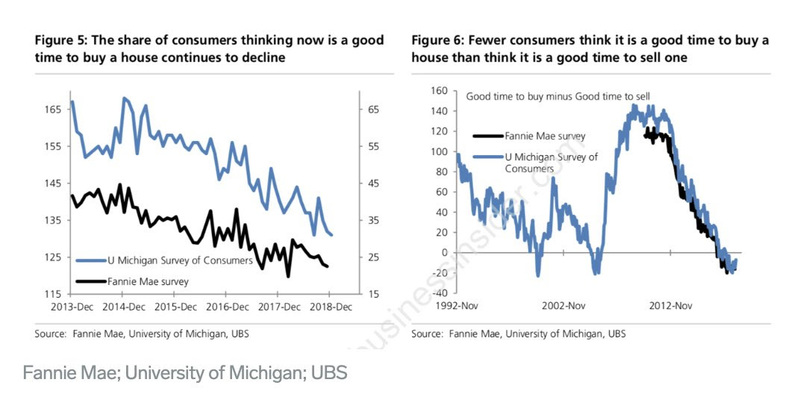 Consumer demand is not hot and there is a lot of rural stress. And what else does well as the Dollar loses steam and when the world looks dangerous? Gold rallied hard with Gold Miners up 4.5%. Silver rallied even harder. Previous rallies on Friday have dissipated during the following week. Will this rally be different? At that rate, even the 280 million customer base can only generate $560 million. At that rate, it would take Reliance almost 75 months to get their investment money back just on revenue & assuming zero operating costs. On the other hand, the same customer base watches “almost 5 billion hours of video a month on their mobile phones and fiber broadband connections with [Reliance] Jio [phones]“. That has been the way for both Reliance in India and Amazon in America. The twain shall meet soon. This Saturday is India’s Republic Day. National Geographic is unveiling the premier of Extreme Flying, a documentary on Indian Air Force. What web-platform did National Geographic choose to launch their documentary? Not Netflix in India, not Amazon Prime Video. They chose Hotstar, the web platform that is becoming a content giant in India. For more details, refer to the discussion on Hotstar vs. Netflix in our last week’s article.